We love to talk about property prices in this country. When they were going up, Saturday afternoon BBQs were filled with positive talk and confident predictions of a never-ending bull market. Now that prices have started to reverse, the conversation is less bullish and revolves around how far they will fall. We have been clear in the past that we believe that there are two key factors that make this downturn different. The first factor is the Reserve Bank of Australia. Every other property downturn in recent history has been reversed by the RBA cutting interest rates. Unfortunately at 1.5% they have effectively used up their firepower and have limited scope to act. In addition, Phil Lowe has been vocal about the fact that they won’t cut. The second factor that makes this time different is the building boom that has accompanied it. It has been the largest boom, in construction volume, Australia has ever seen. Relative to the size of the economy, residential construction has been running near its highest level since the 1980s. Note that the decline from 2005 onwards was largely not the result of falling residential investment but of growth in the size of the economy due to the resource boom. Relative to previous peaks in construction, this one has been long lived and has added the most to economic growth. Dean Baker from the Centre for Policy and Economic Research recently published an excellent study of the US housing bubble in a paper entitled “The Housing Bubble and the Great Recession: 10 years later on.” There are many lessons from this paper that we can apply to Australia. It is the second point that we find a lot of Australian economists and market commentators focus on whilst typically ignoring the first. They worry that if house prices fall, consumption will follow suit. We agree with this sentiment but also acknowledge that we haven’t seen the consumption boom the US has. There was a short-lived bounce in 2013/14 a few years after the RBA easing cycle began but overall the household response has been limited. There are a few reasons behind this. The major response from households was to borrow to buy property. Households took on more and more debt. 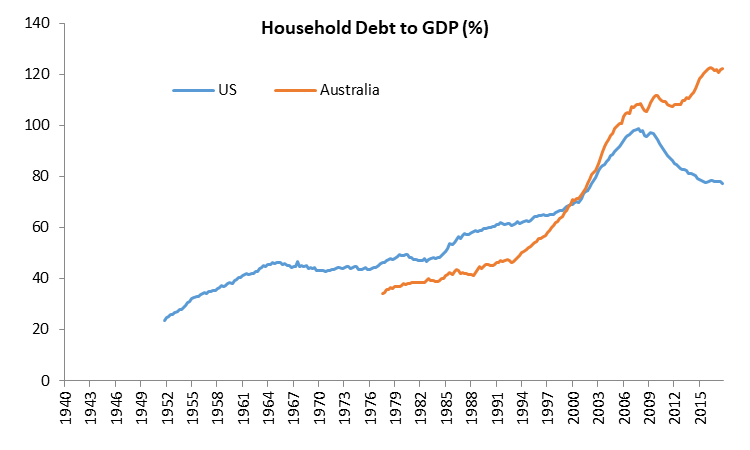 The household debt in Australia now far exceeds where the US got to into 2007. 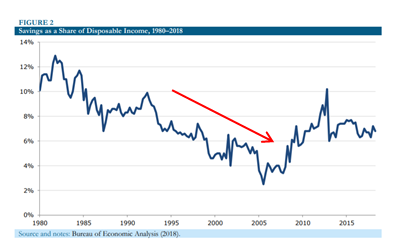 In turn, higher debt levels combined with low wage growth has forced the household savings ratio down to its lowest level since 2008. Note the similar fall in the US household savings rate leading into 2007. What this means is that households are vulnerable. A small shock can have big consequences. The RBA and APRA are aware of this and are therefore trying to engineer a “soft landing”. The RBA is in no position to raise interest rates unless it sees an offsetting rise in wages (something they have been wanting for a while). House price falls to date have been driven by tighter credit from the Royal Commission fallout and a pullback in irresponsible lending as well as more recently “out of cycle” interest rate rises from the banks due to wholesale funding costs going up. Household consumption growth will most likely continue to be subdued at best. 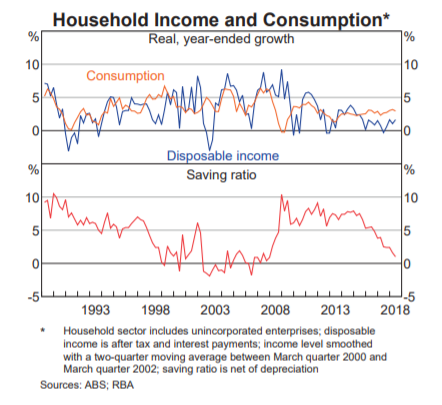 If house prices continue to fall, then in the absence of a rate cut from the RBA we would expected the household savings ratio to rise and act as a drag on the economy. Moving to the first point above (“It pushed residential construction to record levels of GDP”), we think, as mentioned, that this is something that is overlooked by most Australian economists and market commentators. A housing bubble combined with a building boom can bring about its own demise and doesn’t need an external catalyst. 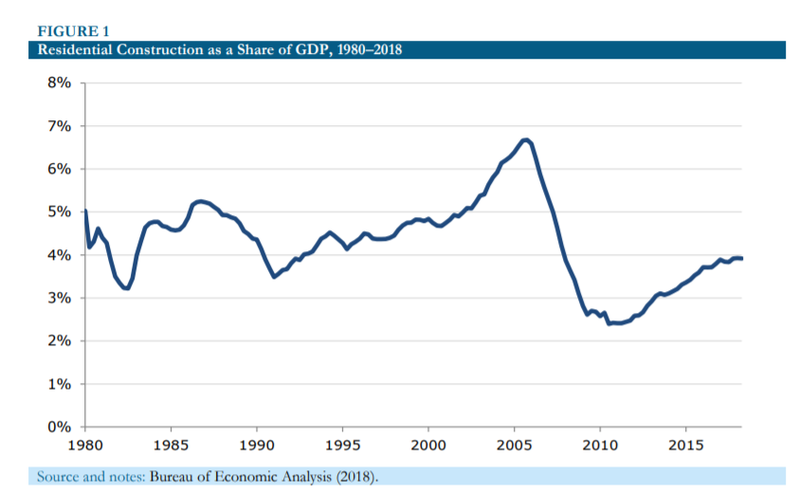 Looking back to the US experience and we can see that residential construction surged as a proportion of GDP from 2000 to 2005. The resulting unwind took it from 6.8% of GDP to well below its historical average. It bottomed out in 2010/11 at 2.8% of GDP. Lower demand for the purchase of housing via tighter credit is likely to flow through to supply. It can become a vicious cycle, tighter credit leads to lower demand and stalling prices, supply drops, unemployment rises which leads to less of an ability to take on credit. We can see the second part of this cycle coming. Building approvals have dropped by 9.4% and 4.6% the last two months. They now appear to be rolling over after a bounce last year driven by Melbourne apartments. On an annualised rate they are now 6.1% below their peak. The outlook for residential construction is deteriorating and a key part of employment growth in recent years is starting to rollover. 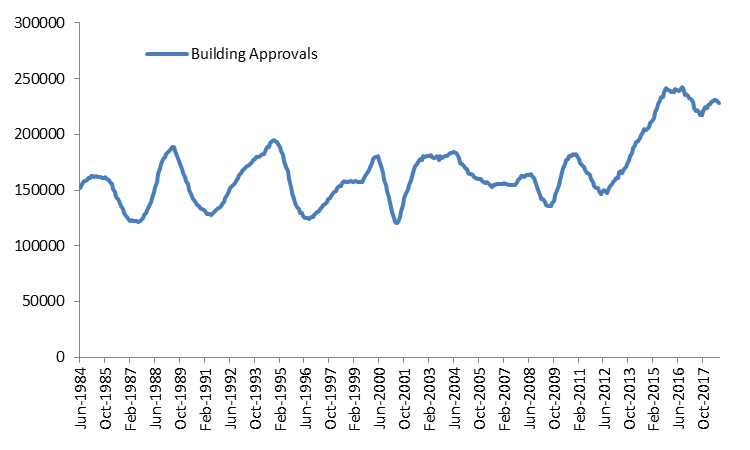 In addition to the building approvals, the AIG Construction PMI recently fell below 50 signalling contraction. New orders and employment both fell in the most recent release and are also below 50. 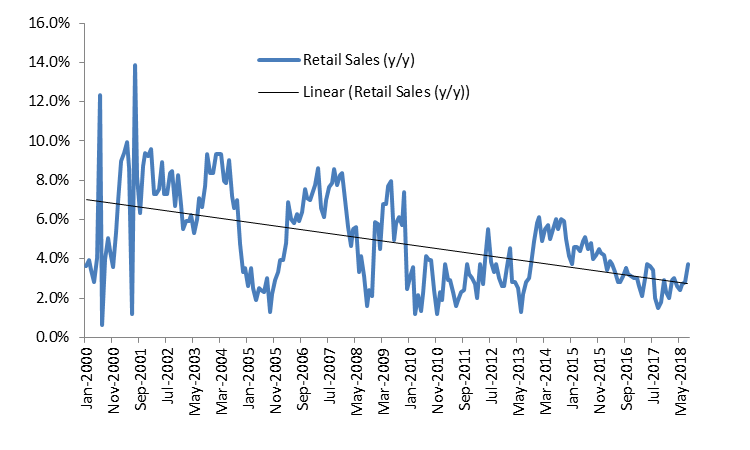 This construction bubble and the potential of a vicious cycle is what APRA and the RBA should be monitoring closely. They are trying to engineer a “soft landing” but we are sceptical of their ability to successfully do so. We are unaware of any property market in history that has become as elevated as Australia and escaped with a “soft landing”. There are obviously a few key differences between Australia and the US that need to be addressed. Population growth is the one that comes up often. The question we have to ask is will they come if there are no jobs? 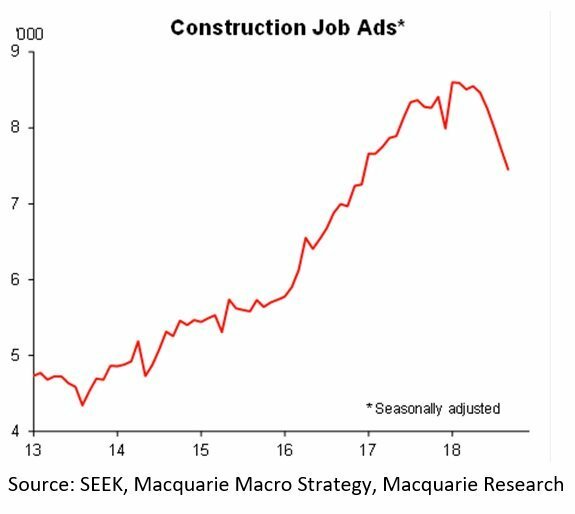 If the residential construction boom slows and employment growth stalls, then unemployment will rise, the dollar will likely drop and salaries will start to fall on a global basis. When we look back at the major property bubbles of the 2007/08 period, we find that in a lot of instances population growth peaked in line with the property market. The other major difference is the current fiscal stimulus being employed in Australia, predominately in Infrastructure. After years of high population and underinvestment, it is basically being forced on both the Central and State governments. 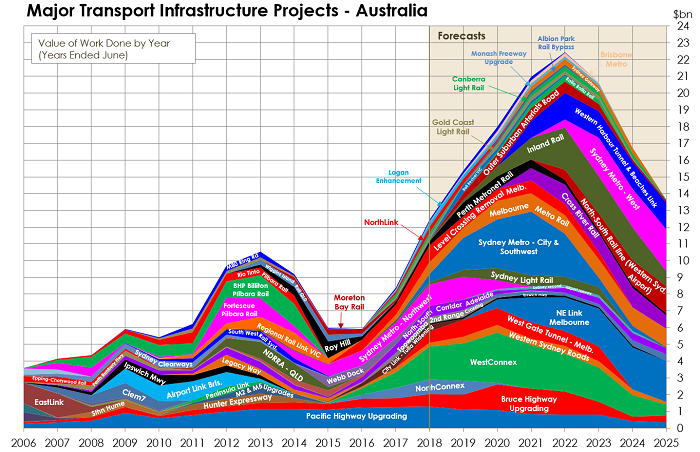 The chart below looks at the outlook for major infrastructure projects across Australia. From this chart we can see we that an increase in spend of $10bn is expected from c. $12bn to $22bn (note this peak has been revised up from $18bn just 12 months ago). This is just the major projects and service work is expected to increase as well. The growth over the next four years is 83%. For the companies exposed to this, the potential growth is phenomenal. It’s a thematic we like and one we are exposed to. Although we do note the rising risk of cost and margin pressures in the space due to an elevated oil price and falling Australian dollar. However, when we put it in context of the economy it’s perhaps not as important as it appears. The residential construction market is currently worth over $78bn per annum. A $10bn fall therefore would represent a decline of 12% and completely offset the growth from the above infrastructure investment. Given approvals are 6% off their peak already this doesn’t leave much room for further downside. This therefore leads us to believe there are still considerable risks to the domestic economy. The vulnerability of households is clear. Whilst the RBA is in no position to raise rates, the availability of credit and wholesale funding markets are pushing finance costs up. If this squeeze continues the property market might find itself in a downward spiral. The wobbles are just starting and it is early days. There are some things that may cause us to change our mind such as an easing in wholesale funding costs, regulators back flipping on tightening credit (although that just may be a sugar hit), or the emergence of wage growth. In the absence of these, watch out below.